Target executive functioning and study skills necessary for academic success at the middle and high school level. The bundle includes over 500 pages full of lessons, templates, and workbook pages to teach study strategies and ways to improve executive functioning skills. It includes a huge collection of my executive functioning and study skills materials in one place. This comprehensive set of materials can be used by regular education teachers, special education teachers, other support professionals, intervention tutors, and anyone working to help students improve their study habits. These materials can also be used during advisory for middle and high school students. A pacing guide is included to help you teach all of these resources for the year (36 weeks) or the semester (18 weeks). Blank pacing guides are also included for you to make your own individualized plans based on your students and classroom needs. Save Over 25% With a Bundle! 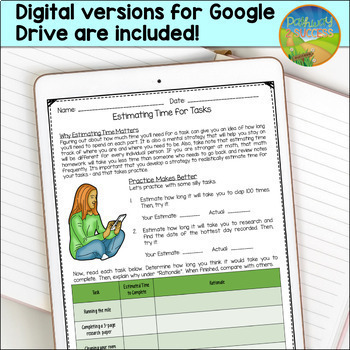 This is a 45-page document with lessons, activities, and posters aimed to teach specific executive functioning skills. 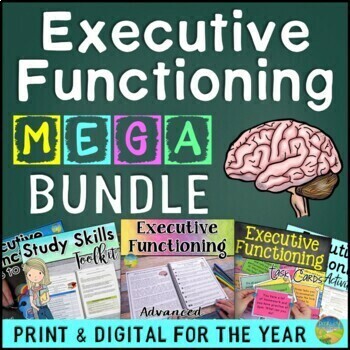 Executive functioning skills targeted in this set include: planning, organization, time management, task initiation, working memory, metacognition, self-control, sustained attention, flexibility, and perseverance. Each lesson includes a description of the skill, a pre-assessment, and activities to practice the skill. These lessons can be used with students from upper elementary all the way through high school. This is a study skills toolkit with over 30 pages of student worksheets, guides, and templates teaching critical study skills necessary for academic success. Study skills targeted include using a homework folder, getting organized, prioritizing work, several ways to study for tests and quizzes, test taking strategies, note-taking, developing a study space, and more. The printable worksheets include student-friendly language, extended practice, and visuals. This document includes student worksheets aimed at helping students create their own SMART goals. SMART goals are written so that students can specifically target what areas they need to change, identify HOW they can make improvements, and set a deadline for when the goal should be met. These Executive Functioning Task Cards are a set of 160 task cards that focus on all areas of executive functioning skills. The task cards are aimed to help students at higher elementary, middle, and high school who need help with their executive functioning skills. Teach and practice executive functioning skills with these Executive Functioning Keys to Success. The keys include a short description of each executive functioning skill and a visual. This is a bulletin board set just focusing on critical executive functioning skills. Skills include: Planning, organization, time management, working memory, metacognition, self-control, sustained attention, flexibility, and perseverance. Teach and practice executive functioning skills with this Executive Functioning Flip Book. Each page details an executive functioning skill including: planning, organization, time management, task initiation, working memory, metacognition, self-control, attention, flexibility, and perseverance. Students put their flip books together as a learning tool that they can keep.